When considering an Alabama steel building or a metal carport, there are three things you should really consider when choosing a vendor: Quality of Materials and Experience & Reputation. We manufacture our own parts right here in our Alabama factory and we fabricate them from the best quality of American made steel. Our insistence to use only US steel is because American steel meets or exceeds certain specifications for architectural steel. It seems like an obvious choice to make when you’re building something that might have people inside or under it, but not everyone comes to that conclusion. Just use your eyes and some common sense and you can see the difference even in our brackets and the way they are attached. In the left picture you’ll see 2.25” x 2.25” tube used as a structural upright corner brace on a metal building made by another company. 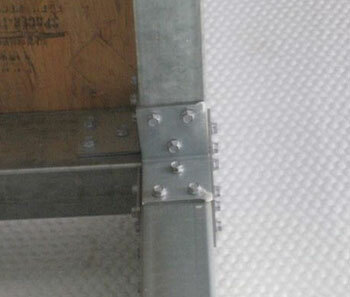 On the right-hand picture, you see ours: 2” x 3” tube used for a structural corner brace—always! Here you see a bracket that is so thin it has been damaged simply from the torque of the screws. Here there are only two screws used per side and they are lined up offering no extra resistance for wind shear. 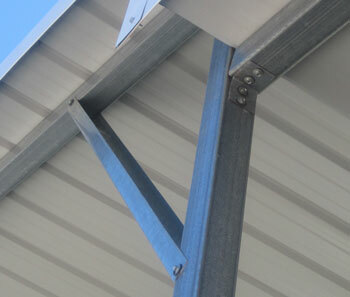 Here you see 2.25” x 2.25” tube used as a structural upright corner brace on a metal building made by another company. Here you see a Waldrop Manufacturing bracket that is heavy 12 gauge US-made steel which meets all Uniform Building Code requirements. Here you see each connection has three screws per side placed properly so as to maximize for wind shear. Here you see a Waldrop 2” x 3” tube used for a structural corner brace - always! It’s the total of all these little things and more that makes the difference when considering quality of materials! Waldrop Manufacturing has shipped its steel buildings to almost every State in the Union. Our buildings are in use by commercial mining operations, deep down in the moist underground of the Southeast, and they are in the arid deserts of the Southwest. Our metal structures in the mountains of the northwestern U.S. under snow loads of 65 PSI. We’ve supplied countless municipalities, other states, and thousands of American households with our metal building and steel carport products. With Waldrop Manufacturing, you are dealing with one company that takes care of the entire process from helping you with your concept to following it through to production. Whatever the stage in your building plan, you can call and speak to real people who are involved with the whole process - how refreshing! When it comes to a tubular steel building system - metal buildings, covered parking, steel carports, equipment storage, RV covers, barns - we have experience with in all aspects of it. Our Experience is Here to Back You Up!